-A human microchip implant is an identifying integrated circuit device or RFID transponder encased in silicate glass and implanted in the body of a human being. A subdermal implant typically contains a unique ID number that can be linked to information contained in an external database, such as personal identification, medical history, medications, allergies, and contact information. -Theoretically, a GPS-enabled chip could one day make it possible for individuals to be physically located by latitude, longitude, altitude, speed, and direction of movement. Such implantable GPS devices are not technically feasible at this time. However, if widely deployed at some future point, implantable GPS devices could conceivably allow authorities to locate missing persons and/or fugitives and those who fled from a crime scene. Critics contend, however, that the technology could lead to political repression as governments could use implants to track and persecute human rights activists, labor activists, civil dissidents, and political opponents; criminals and domestic abusers could use them to stalk and harass their victims; slaveholders could use them to prevent captives from escaping; and child abusers could use them to locate and abduct children. -Anti-RFID advocates cite veterinary and toxicological studies carried out from 1996 to 2006 that found lab mice and rats injected with microchips sometimes developed cancerous tumors around the microchips (subcutaneous sarcomas) as evidence of a human implantation risk. -According to the FDA, implantation of the VeriChip poses potential medical downsides. 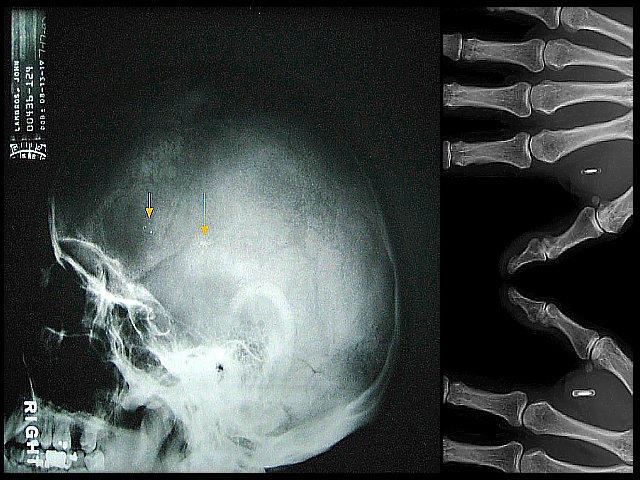 Electrical hazards, magnetic resonance imaging (MRI) incompatibility, adverse tissue reaction, and migration of the implanted transponder are just a few of the potential risks associated with the Verichip ID implant device, according to an October 12, 2004 letter issued by the FDA. Since nearly all implantable microchips are unencrypted, they are extremely vulnerable to being read by third-party scanners. By scanning secretly, someone could steal the information on a chip and clone the signal, enabling that person to impersonate a chipped individual. This could create security problems for building or computer access or potentially enable criminal misuse of a medical account held by an unrelated person. 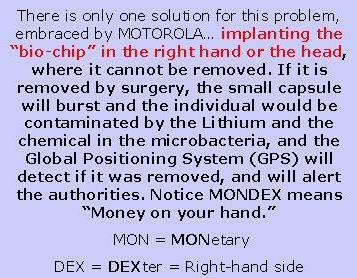 Also, the chip could easily[clarification needed] be removed from the person, or the appendage containing the device could be removed. This entry was posted on Saturday, February 14th, 2015 at 2:45 am	and posted in VICTIMED. You can follow any responses to this entry through the RSS 2.0 feed. Can anyone who has a RFID reader or Bluetooth device gain access to your RFID and take info off it or put false information on it .Can RFID be used to carry info from one source to another (good old pigeon carrier) ? If inserted into humans and unscrupulous persons input false data and somehow gets you to react to this in a unfamiliar way,hows the best way to deal with such a situation do you…. :Run over to your nearest hospital and ask security to check times and dates so that they can find out who the unscrupulous persons are and contact the police to put them truly in their place once and for all. :Put up with this harassment because nobody believes you and that’s what there counting on! :Use neodymium magnets to help lower the RFID strength.